Heavy clashes broke out during two consecutive days as Israeli forces stormed the Bab Al-Zawiah neighborhood in Hebron, attacking young Palestinians protesting in solidarity with the ongoing prisoners’ hunger strike. It resulted in multiple persons being injured, caused by live ammunition and teargas, and at least one protester being detained. 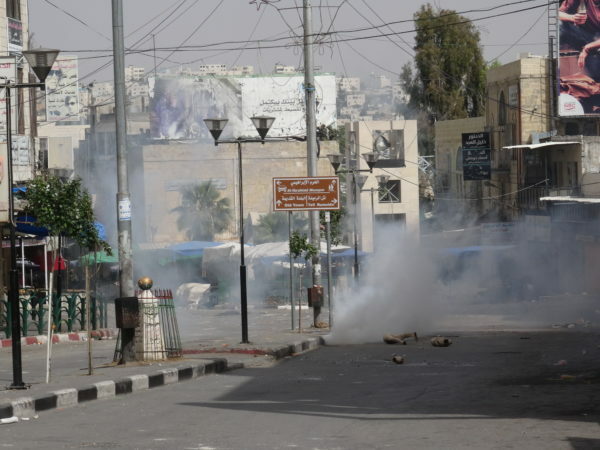 Clashes erupted on Thursday in the Bab al-Zawiyah area of Hebron between Palestinian youths and the forces of the Israeli Army and Border Police. 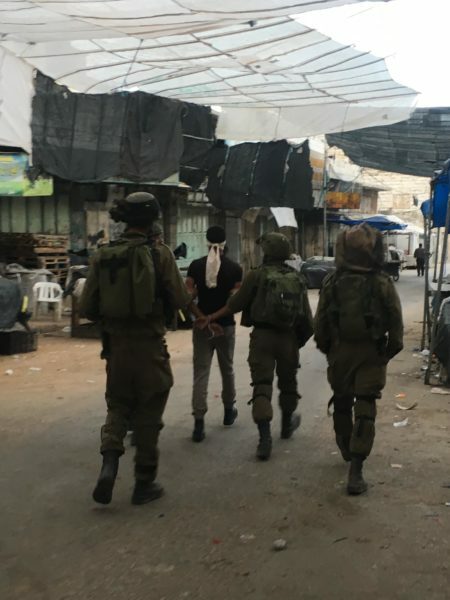 Minor confrontations occurred in the souq in the morning before the situation escalated at noon when several platoons of Israeli soldiers, accompanied by Border Police, entered Bab al-Zawiah in the Palestinian controlled H1 area, causing anger among the hundred-or-so Palestinian youths gathered there. On Thursday, a general strike was held across occupied Palestine in solidarity with the 1500 Palestinians currently on hunger strike in Israeli prisons, demanding their right to humane and fair treatment in accordance with international law. Consequently, all shops and public transportation were shut down during the day. 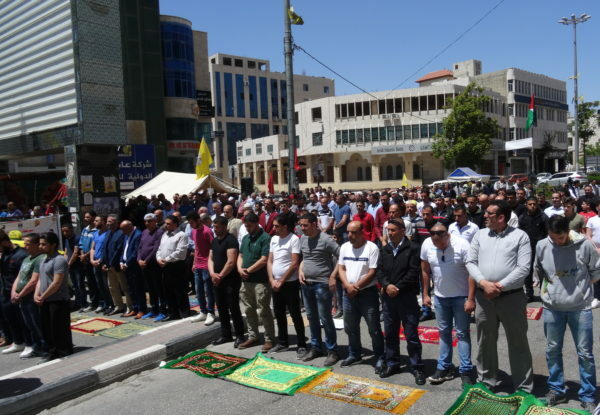 Many Palestinian youths had gathered in the Bab al-Zawiyah neighbourhood – not far from Ibn Rusht square, where the solidarity tent is placed in support of the hunger striking prisoners – to express their anger through spontaneous protests. 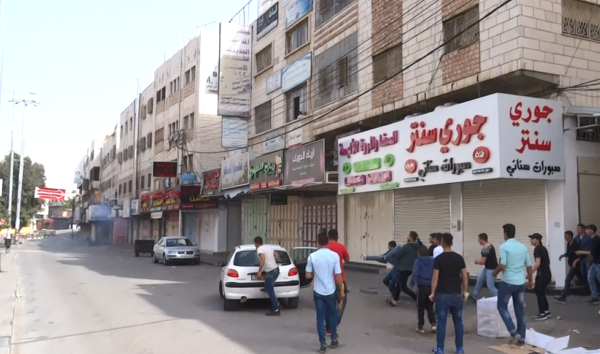 At around 12:30 on Thursday, at least two platoons of Israeli soldiers and around 10 border policemen made their way up the souq towards the vegetable market and Bab al-Zawiya. While initially seemingly halting their movements at the H1/H2 border, the soldiers soon took up positions around 200 meters into the nominally Palestinian controlled H1. From there, the Israeli forces began bombarding the surrounding area with teargas and sound grenades, as well as shooting live ammunition into the crowd of protesters. 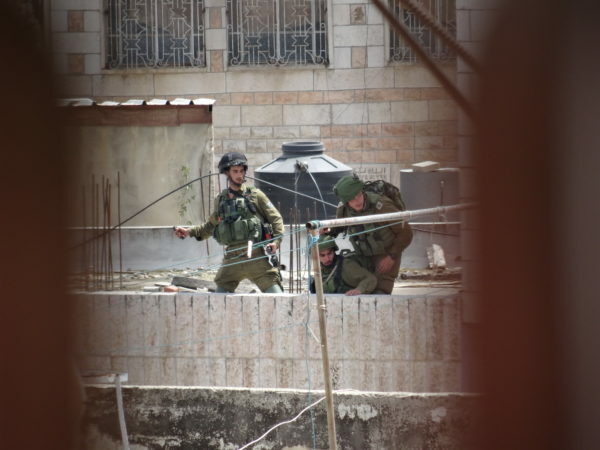 Additional groups of Israeli forces soon swamped the roofs of the area, from which protesters were targeted with continuous showers of sound grenades. Swaying back and forth among a few centrally located streets, the clashes continued for several hours as the ground became littered with empty teargas canisters, grenades, and used bullets. Fighting continued throughout the day as Israeli forces used live ammunition, sound grenades, and large amounts of teargas against Palestinians, who responded by throwing stones and burning tires. In addition to the numerous injuries caused by the indiscriminate firing of teargas canisters, ISM activists witnessed at least two Palestinians being seriously wounded after being shot with live ammunition in their feet. The two young protesters were quickly carried away and rushed to hospital. 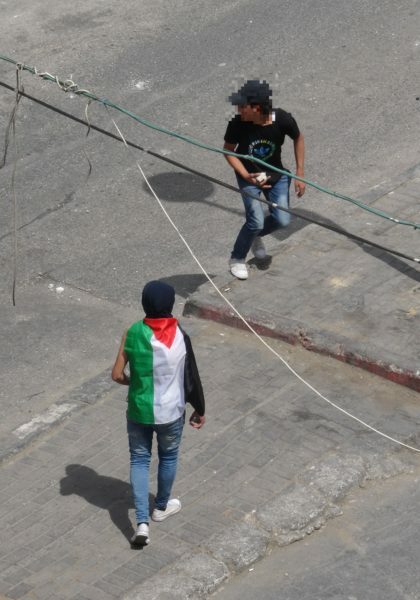 Later in the afternoon the intensity of the clashes began to subside as the Israeli forces retreated back into H2. However, at around 17:30 several platoons of soldiers began to once again cross into Bab al-Zawiya which was by then all but empty. Their incursion soon caused renewed anger among the youths still present in the area, resulting in a resumption of clashes. Two Israeli army jeeps sped towards Ibn Rusht square shortly before 18:00, followed by dozens of soldiers. However, the remaining protesters prevented them from reaching the square by setting up barricades. Soldiers began to enter private yards and parking lots adjacent to the streets leading up to the square. A standoff then ensued with Israeli soldiers yet again hurling grenades and firing rubber bullets into the crowd. At the peak of the army incursion – which primarily went up Faisal al-Maliki Street – the soldiers reached almost 500 meters inside H1. As well as the army jeeps, there were also at least 50 soldiers accompanied by an Armoured Personnel Carrier and a water cannon truck. 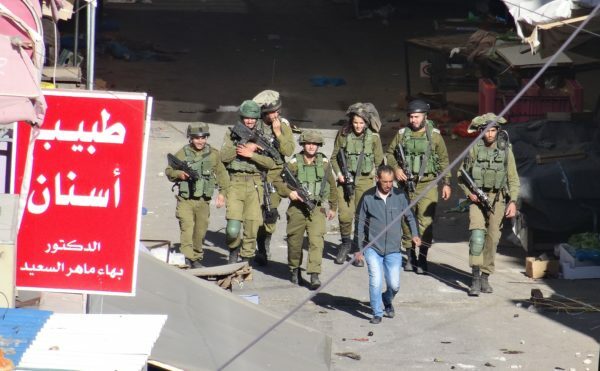 Before finally retreating from Bab al-Zawiya into H2, a group of soldiers detained a young Palestinian man before escorting him, handcuffed and blindfolded, into the Beit Romano military base. When asked about the charges against the man, an Israeli army officer claimed that he had attempted to stab a soldier in the souq. Given the place of arrest and actions of the soldiers at the time – i.e., using live ammunition from long range – the ISM concludes that the stated scenario is highly implausible, but have not been able to obtain any other information on the background to the detention. The following day, a “Day of Rage” was called by Fatah and the national committee in solidarity with the Palestinian prisoners. The day started calmly as Palestinian security forces attempted to separate protestors and Israeli soldiers. However, they eventually failed and Israeli forces yet again advanced into Bab al-Zawiyah, firing rubber bullets and teargas. Several army vehicles, including a water cannon truck, spearheaded the charge before grinding to a halt half a kilometre into H1. Clashes continued for several hours, only to calm down when the contingents of soldiers retreated into their base at around 20:00. A Friday prayer was conducted at Ibn Rush Square where people gathered to support the relatives of prisoners. Meanwhile,Palestinian security forces were stationed close to the infamous Shuhada checkpoint in an attempt to keep Israeli forces from entering H1 and to keep away potential protestors. At 15:30 in the afternoon, with Palestinian forces now gone from the scene, Israeli forces once again approached Bab al-Zawiyah from the souq. The forces were spearheaded by a water cannon truck which immediately began to spray water towards protestors and into nearby buildings, accompanied by torrents of teargas grenades. At least 50 Israeli soldiers quickly advanced towards Ibn Rusht square and the area around Alia hospital; effectively occupying most of the Bab al-Zawiya neighbourhood within only a few minutes. As well as attacking protesters, soldiers also broke down the doors of private buildings to occupy the rooftops. Border Police also shot so-called “sponge grenades” at the crowds. 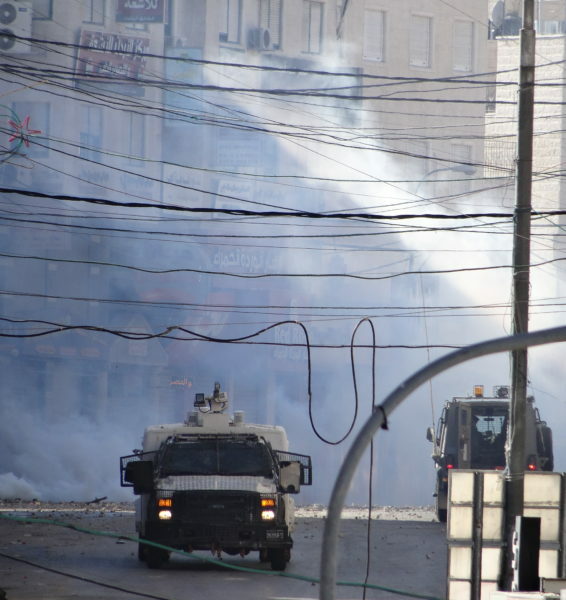 Clashes continued until 17:00 when the soldiers withdrew to H2, only to erupt again half an hour later as Israeli forces poured into the city firing teargas indiscriminately. The drivers of cars who unknowingly tried to pass the area were violently harassed by soldiers who had set up flying checkpoints throughout the city. The sun had already set when the soldiers finally began to retreat towards the military base, leaving behind them screens of teargas which mixed with the smoke of burning tires over Bab al-Zawiyah.